Given what is about to happen here, I really ought to establish my bona fides. I am a huge fan of Richard Borg’s Commands and Colors series. I own the entirety of the Ancients series and have taught it as an introductory wargame at Origins. I think its clean design and relative simplicity make it one of the the best gateways to this hobby of which I am so fond. 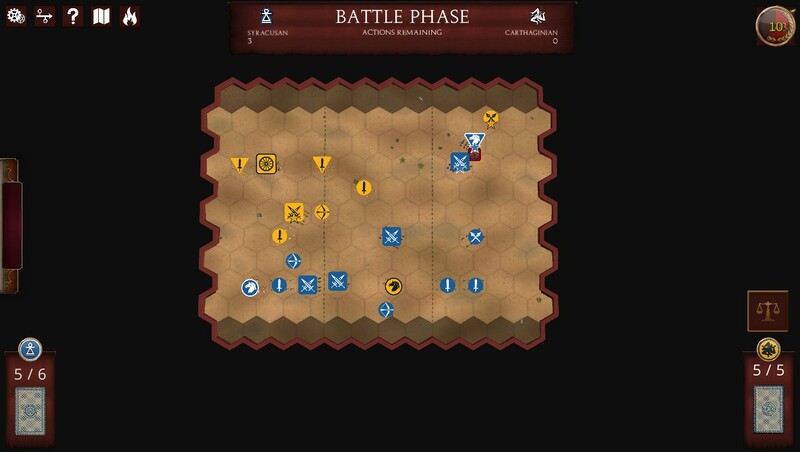 Despite this, when GMT Games announced that it had partnered with Hexwar to bring C&C:A to the PC, I was skeptical. For me, C&C in all its flavors is the perfect game for face-to-face play. The learning curve is reasonable, the time commitment is modest, and it still brings a decent amount of historical flavor. As much as I love more complicated games, my ratio of C&C played to any other system these days is very high. As a result, I felt no particular need for a digital version. And then there is the fact that Field of Glory 2 exists. Byzantine Games’ ancients offering — also an adaptation of a tabletop game — has been the dominant PC game in the field since its release in October of last year. 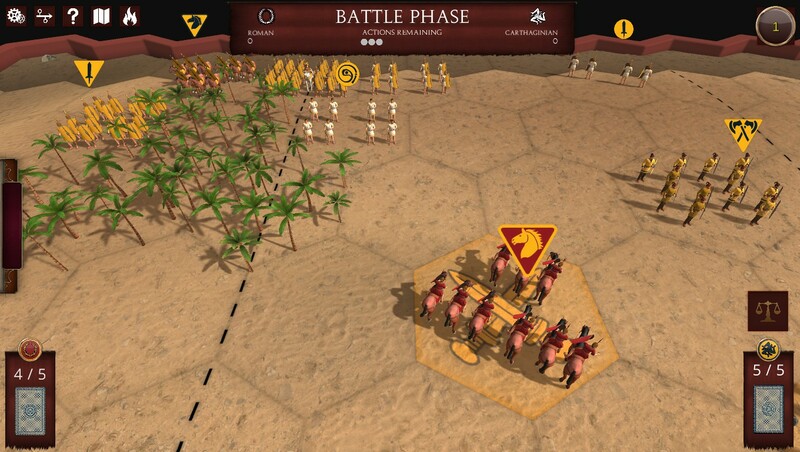 With expansions being released at a rapid rate, it is wide and deep and has introduced the uninitiated to the joys of armies that had nothing to do with Rome, Carthage, or Sparta. I have written of my affection for it before and, so, what is to be made of this fresh-faced newcomer who would contend for FoG2‘s crown? 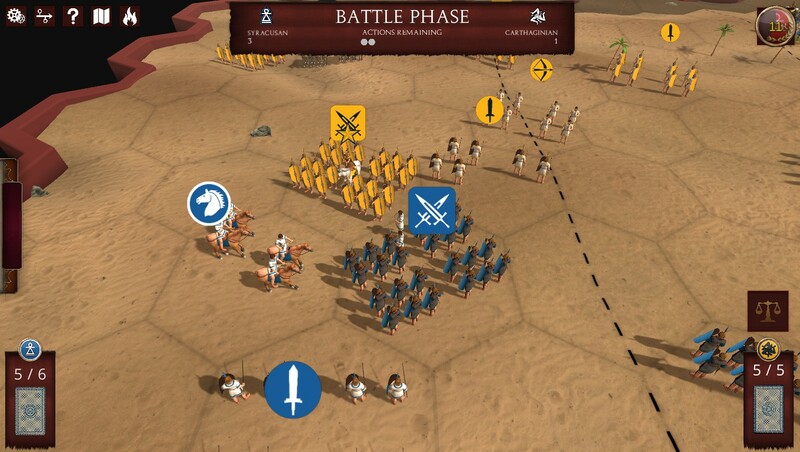 Neither game can give the “ooooh, shiny” champion of ancient gaming Rome II: Total War a run for its money, and neither is trying. They are both abstractions of ancient combat with varying degrees of telescoping scale. One of my biggest issues with FoG2 is that this results in the units being significantly out of scale with some of the depicted terrain and this occasionally makes it difficult for me to wrap my head around what I am seeing on the field. Athwart the river stand we! Also, some of the terrain choices — notably rough — can be difficult to pick out, occasionally until it is too late and your units have been disordered. FoG2‘s units are nicely varied, decently animated, and, most significantly, well represent the incredible array of armies and periods depicted. C&C:A‘s terrain is limited by the scenario choices available. What is on offer keeps close to the look of the board game which is to say it is clean, simple, and efficient. There is no question what terrain occupies a particular space. The units themselves are a step back from those in FoG2. Aesthetic judgments like this one are tricky, so I will just say I prefer those int he older game. The trees are adequate, but I do not like the fact that troops don’t necessarily face those enemies to which they are adjacent. A bit O.C.D. of me, I will warrant. More certain, however, is the sense of scope that FoG2 provides that C&C:A cannot. 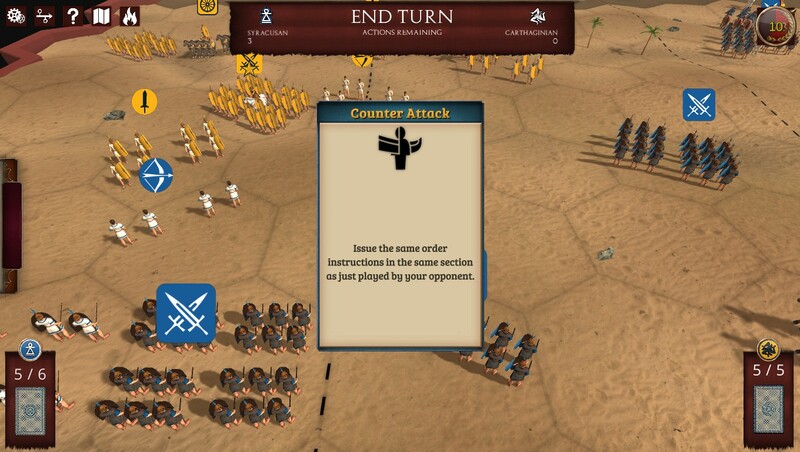 The epic battles in the former can be quite spectacular in their own way and the unfortunate decision to omit any epic scenarios from C&C:A stands as a strong mark against it. Come and freaking get some. Also worth mentioning is the profoundly disappointing card art in C&C:A which struck me as something straight out of a War College CPX Powerpoint; a strange omission in a game where cards play a central role. FoG2, viewed from the tabletop perspective, is the more complicated game. That does not necessarily make it the better one. There is much that goes on beneath the user interface in that game — as on the tabletop — that is only understood after a close reading of the game manual. Interactions between terrain, FoG2’s perceptions as to which formations and weapons are advantaged and disadvantaged against others, the role of commanders and sub-commanders, and a host of other issues take real study and, for me at least, the learning curve was not exactly steep, but it came with its share of frustrations. This is particularly true of combat which, even as of this writing, still holds mysteries for me. One of the really seductive aspects of FoG2 is that the interface is so well designed that it will let you play the game with a “click-click-click” insouciance that is not in your best interests. You can shove those horsemen straight into a phalanx or those average foot into those Indian archers (do NOT do this, trust me), but you cannot win this way. Once you do get better at the engine underneath it all, the interface usually has the courtesy to stay out of your way. C&C:A is just what it says on the tin. Mostly. It is a game in which soldiers are ordered by cards played from a hand of predetermined size. Each player plays one card each turn. These cards order units deployed onto a board divided into three sectors. There are many different types of cards, but most allow the player to move a certain number of units in a certain portion of the battlefield. 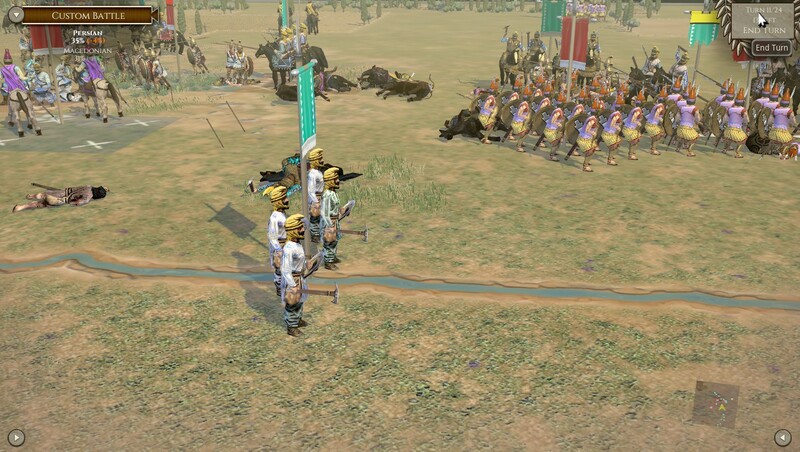 A few have special effects like allowing skirmishers to, well, skirmish by moving, shooting, and then moving again; others allow archers to fire twice; and another type moves an entire line of units attached to a leader all at once. Units that move can typically also either engage in ranged combat or melee — although not always. Combat is resolved by rolling a set of special dice, the number of dice rolled varying by the unit attacking. Depending on the symbols rolled, opponents can either be killed, made to retreat, or come out unscathed. There’s certainly more to it than this, but, if you are familiar with the boardgame version, you will have no need of the tutorial. The first knock against C&C:A as released is the curious omission of the ability of leaders to attach and detach from units. Leaders, as they should, play a very large role in the command-and-control system and requiring them to remain with the units with which they deploy was a bug (I suspect) that should have been caught before release. Far worse, though, is C&C:A‘s pacing. As I said above, I have taught this game for several years to children as young as five. I can teach it in minutes and be done with the first scenario in well less than an hour — with a human opponent. In fact, the brisk place at which this game plays is one of its charms. The electronic version offers none of this. It is bad enough that the silly dice-rolling animation cannot be turned off despite a menu option that says you can. Every step of the cardplay, movement, and combat process seems purpose-built to slow the whole show down. To take only the most grievous example, whenever the A.I. draws a card, the game takes it upon itself to show you the card being drawn and then displays the back of the card just drawn for a few moments. I do not know what that is for. And, while I am open to the idea that senility has overtaken me, I could not for the life of me find an “Undo” button which in a light game of this type should simply have been included. In fairness, the A.I. gives a decent fight, but what it offers is buried beneath an interface that was not ready for release. Look away. Just look away. Even at launch, FoG2 was an embarrassment of riches. Dozens of unit types, 12 pre-set battles of various sizes, a historical battle generator, a campaign system, and a random terrain generator. 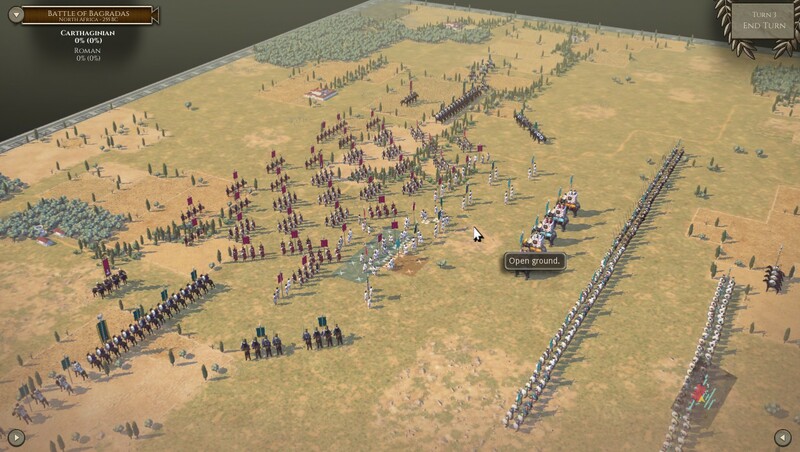 Also, while it has at time driven me to distraction, it came with Slitherine’s PBEM++ multi-player system that, while entirely inferior to live multi-play, is still an efficient way for gamers remote from one another to play head-to-head. It is in no small part the reason for my logging as many hours with the game as I have. I will ignore the grammar of that first bullet point. I will ignore the fact that no C&C game of which I am aware involves “strategic choices”. I will only restate a comment I have made elsewhere that if your brag sheet includes mention of the number of combat and command cards your PC game is using, you are not offering enough content. And, yes, this game shipped without multi-player. A game of this limited content and complexity and — theoretically — low turn time, is single player only at launch. If you follow the forums for this game, it seems the folks at Hexwar know they have much to do. I do not know if I ever really needed a version of C&C on my PC, but, for those that do, I hope they eventually get a good one. If you are a predominantly PC gamer, buy FoG2. It was never a fair fight. If you want to play C&C:A, buy the boxed version, call up a friend, pour out some mead, and have at each other face-to-face. Hexwar’s digital offering is, in its current state, unfinished, ungainly, and, ultimately, unnecessary.